Not only is today FridayPieDay, it's also the day after Thanksgiving, a holiday with a dessert table that centers around pie in my family. This year we had a mid-size gathering at my mom's house—just mom, her kids, and our kids which makes 15 people total. And yet, we still wound up with 5 pies. 3 people to a pie. It's funny because there was only 1 pie and 1 cake scheduled in the initial "plan". We'd all volunteered to bring certain dishes and apparently all decided, individually, that 1 pie just wasn't going to cut it. And who knows what happened to the cake because it wound up being a no-show. I'd been the one to say I'd bring a pie (along with 4 other things). I wanted to try something new, so I made a Cranberry Apple Crunch Pie. The tangy cranberries really were the star. The apples play a very supporting role, and I think that next time I'll probably triple them to add more bulk to the filling. I don't even think adding more apples will affect the flavor too much. The tart center is complemented nicely by the crunchy streusel topping (which I won't change at all next time). But as I sat there, the pie cooling on its rack, I wondered what we were thinking only having 1 pie. It would never be enough. Plus, a Thanksgiving without a pumpkin pie and a pecan pie isn't really Thanksgiving at all in my family. 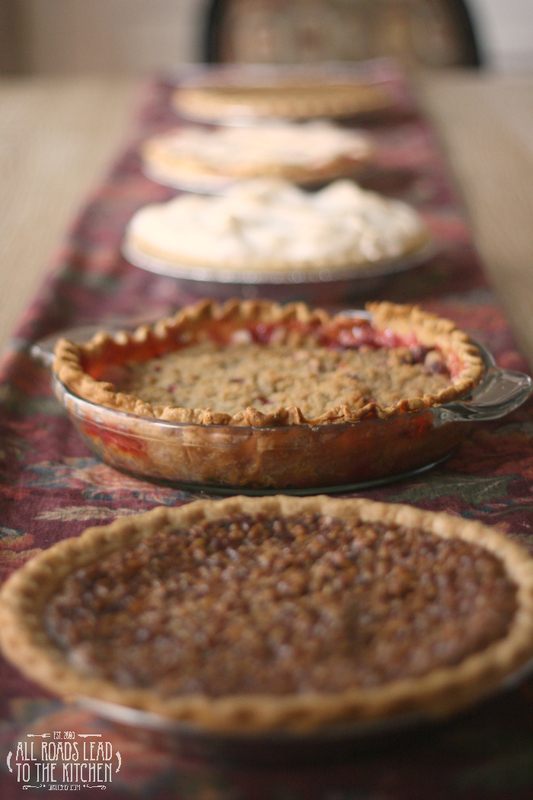 Apparently, my sisters had the same thoughts running through their heads, because we wound up with the Cranberry Apple Crunch Pie, a pecan pie, a pumpkin pie, a lemon meringue pie, and a sour cherry pie. Disaster averted, Thanksgiving saved. 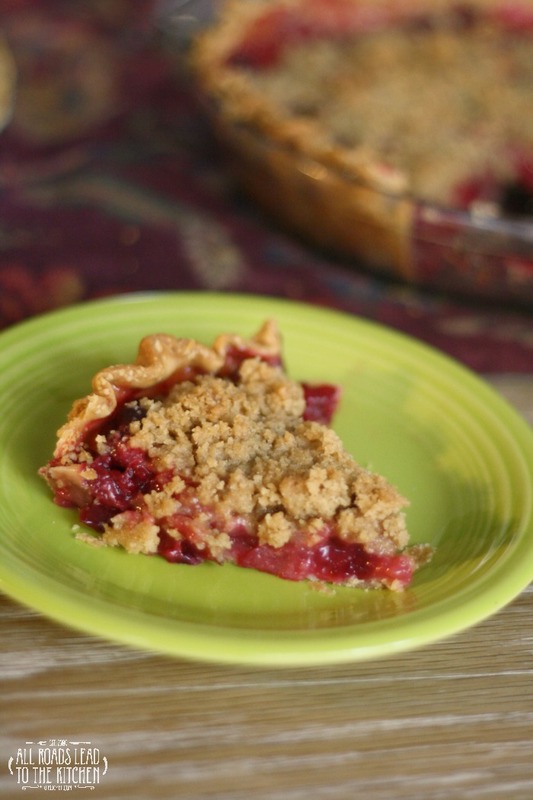 A cranberry-apple pie recipe with a lightly tart filling under a crunchy crumb topping. Simple enough for every day, but delicious enough for your holiday table. Roll out your pie crust (or unfold it, if store-bought) then fit it into your pie pan (use a standard height, not a deep-dish). Trim and crimp the edges, then place it into the freezer for 15-20 minutes. Combine the cranberries, apples, sugar, lemon juice, flour, and salt in a large bowl and toss until everything is coated. Let sit at room temperature for 10 minutes. 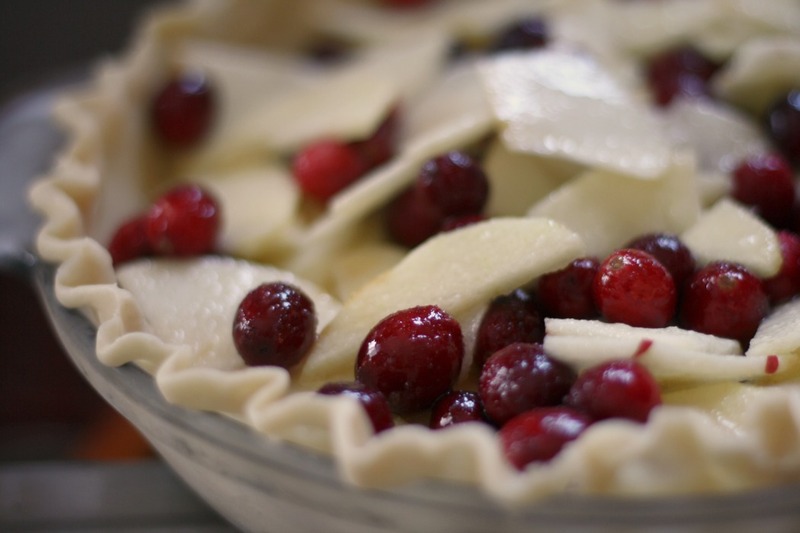 Dump the filling into the chilled pie shell, scraping any sugar and juices left behind on the bowl into the pan. Pat fruit down so that it's even, then slide into preheated oven and bake for 30 minutes. While the pie is baking, stir together the flour, brown sugar, cinnamon, and salt for the topping until it is well combined. Tumble the butter into the mixture and using your fingers, rub the butter into the dry mixture until you have coarse crumbs and no dry, powdery spots left. Refrigerate until needed. 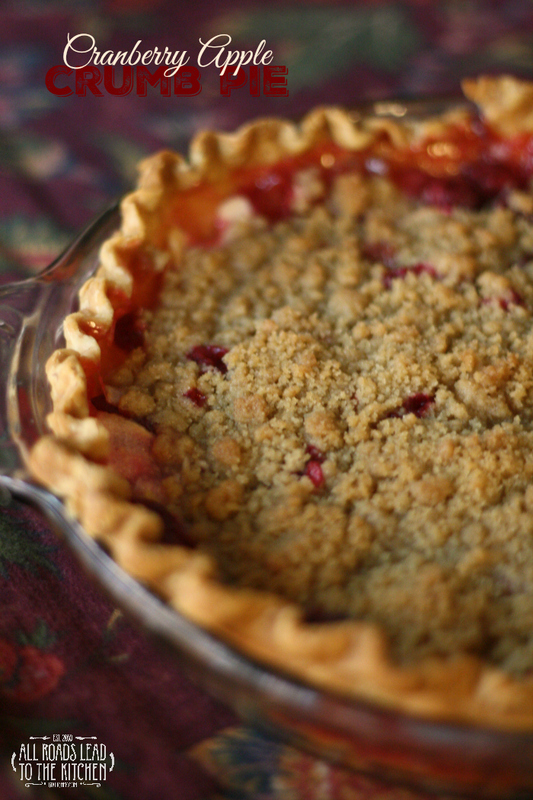 After that 30 minutes is up, remove the pie from the oven and scatter the crumb topping as evenly over the top as you can. I like to leave a little space around the edges (or here and there) so that the beautiful filling shows in spots. Return the pie to the oven and bake for another 25-30 minutes, until the juices are bubbling up through the topping and around the edges. Set on a wire rack and let it cool for at least 1 hour before slicing. 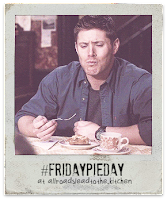 And since it's #FridayPieDay...and since we've learned that 1 pie is never enough...I hope you'll drop by and visit a couple of my pie-loving friends who have joined me again this month! Stacy at Food Lust People Love is sharing a Dark Chocolate Orange Crostata and Kimberly at Coffee and Casseroles is sharing her savory Leek and Potato Pot Pie. PIE FOR ALL!